Expand the horizons of your abode with these luxury pieces. The French luxury luggage-maker unveils ten new pieces from its Objets Nomades collection at the Milan Furniture Fair. Mahdavi's side table is inspired by the nomadic hospitality of the Middle East. It consists of a leather-bound portable base which closes like a book and a blue leather marquetry tray displaying an antidote to the evil eye. Blossom Stool is a reference to the historic Louis Vuitton monogram. The stool is available in black and white. There is also a 24-carat gold-chromed version which is an exclusive 12 piece limited edition. These two designers sought inspiration from the candies served at marriages and children's festivals in Brazil. 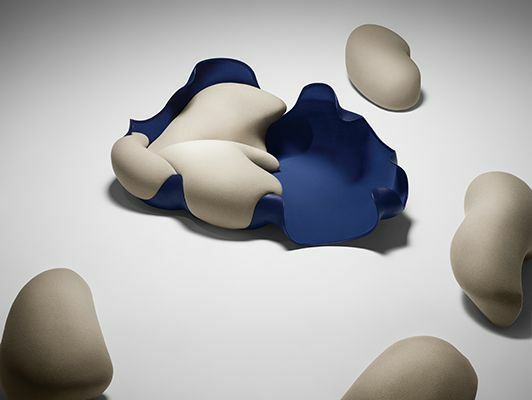 The result is a collection of eight removable cushions laid out on a leather-covered rigid base. The cushions—imade out of fabric or leather—can be used separately as poufs. This remarkable chair is made from woven perforated leather. This leather screen can be suspended from its metal frame or a ceiling. Each piece, which is inspired by the diamond shape of the Louis Vuitton monogram, is held onto the others with brass clasps similar to those found on Louis Vuitton bags. Above the base, this lamp is surrounded by twisted leather straps, each one with natural leather on one side and shiny leather on the other. The lamp is available in two different heights and three colours: beige and gold; red; and blue and silver. An anodised aluminium ring, which holds in the straps, can be moved to change the proportions of the lamp. The Swing Boat sofa was inspired by a vintage folding boat that the Atelier Oï designers use on Switzerland's Lake Biel. Its "hull" is made of canvas reinforced by wooden circles, gilded brass hinges, and comfortable leather cushions. The sofa can swing gently on its leather straps. When it's not being used, it can be folded away—just like the folding boat. This steel-framed chair is wrapped in eight leather straps which provide comfort, strength and durability, and give the seat and back an undulating surface, like a sand dune in 3D. Raw Edges' foldable shelves in aluminium, leather and wood are shaped like an origami boat.